Sylvia Hubbard, Vickye Key, Laurie Roe, Councilman Brian Byrd. 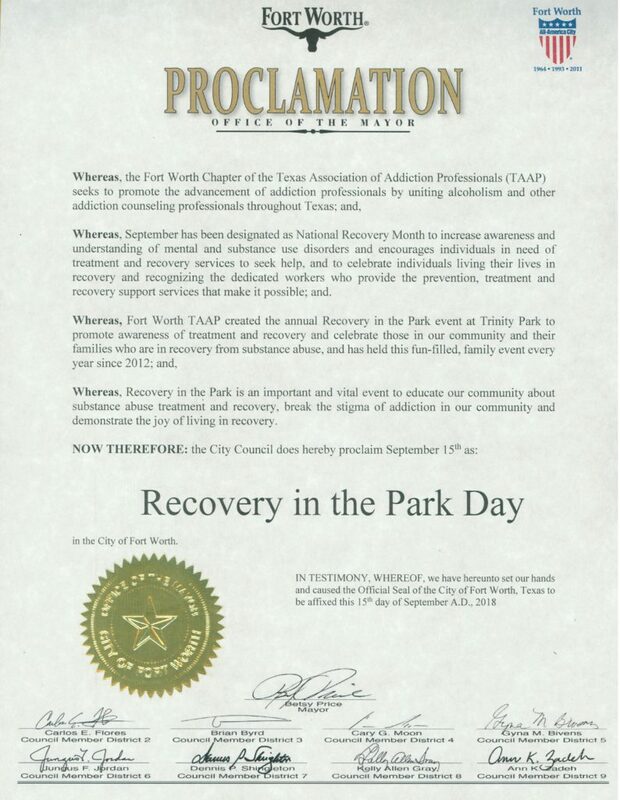 Proclamation, signifying Sept. 15, 2018 as Recovery in the Park Day. Congratulations to our newly elected Vice President Dr. Kimberly Scales-Fair. It is with a heavy heart, we say goodbye to our dear friend, Robert Miles. Robert Miles, better known as Mr. TAAP lived a life encouraging others. He was an advocate for those experiencing addiction. The Texas Association of Addiction Professionals has a large empty space in its membership today. 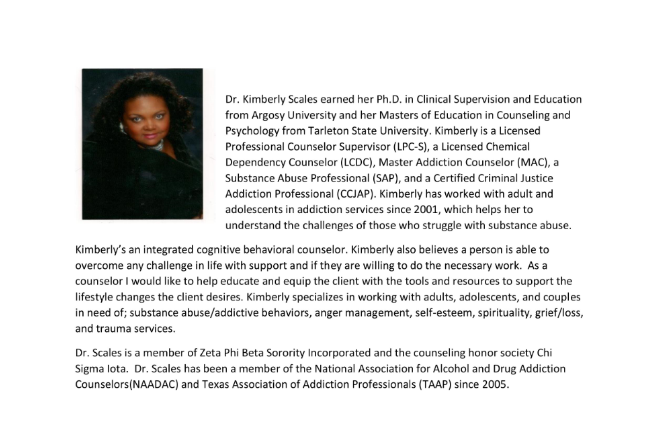 The Texas Association of Addiction Professionals lost a champion on November 27, 2017. Robert Miles helped to establish the local Fort Worth Chapter of TAAP (Texas Association of Addiction Professionals) and was instrumental in developing and organizing the Metamorphosis Conference providing continuing education hours for mental health professionals. Robert sang the Star Spangled Banner during the opening ceremonies each year and always recognized and honored the Veterans in attendance. 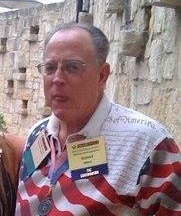 During his tenure as President of TAAP, he encouraged the membership to sponsor the Aaron Rubin Scholarship after the untimely death of Aaron Rubin. This scholarship was established by Aaron Rubin along with Dolores Sutter for students seeking Chemical Dependency Counselor Licensure and was presented to students enrolled in the Mental Health program at Tarrant County College each year during the Metamorphosis Conference. TAAP continues to sponsor five scholarship recipients each year and has provided approximately 50 scholarships to deserving students. Thanks, Robert. Robert was a tenderhearted gentleman who invested most of his life toward helping those experiencing addiction, especially attuned to the family members’ pain and loss. Robert was TAAP Counselor of the Year, both State and Local, TAAP Professional of the Year, both State and Local, and was inducted into the Hall of Fame, State level in 2013. Robert was an avid advocate for change via legislative process. 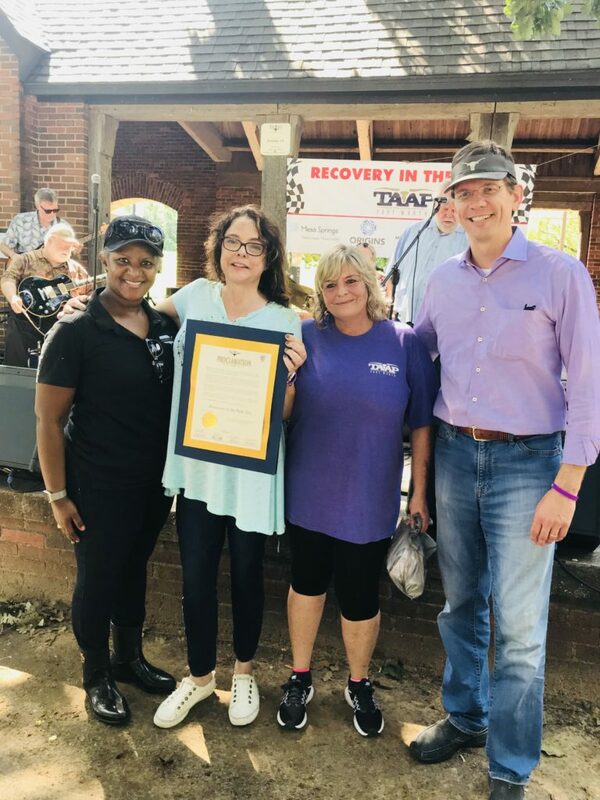 In order to create awareness and education regarding addiction, he organized a group of teens, adults, professionals, and lay persons to attend and present prevention and treatment needs to the Texas Legislative body as well as the Congressional Legislative body in Washington, D.C. When a bill was sponsored that helped the cause, Robert would send a mass e-mail to all asking for support of the bill. Likewise, if it was hurtful to the cause, he would ask for support of rejection of the bill. He titled his message and presentation, “Legislation, Texas Style” and presented this seminar for many local colleges and universities and to the community at large. When asked, he was always focused on recovery at home in his beloved cities of Arlington and Fort Worth. To promote his cause, he helped to create one of the largest Fourth of July Parades in the state of Texas working with current and past mayors and local leaders of Arlington. If you helped Robert with his cause, you would receive a “ticket of prominence” to the parade or perhaps an invitation to ride on his TAAP Float. A friend stated, “Robert floated on his chariot right into Heaven.” As he traveled in that direction, it is quite certain that his chariot was filled with those in need that he met along the way.